Steve Jobs was never a corporate man. The early personal computer industry was an outgrowth of the radical back-to-the-land ethos and even the name “Apple” was intentionally folksy and home-brewed. For Jobs, the personal computer wasn’t a way to bring work home or improve the productivity and accountability of employees. His goal was always computer as appliance, computer as an empowering tool for regular people. He pointed to Stewart Brand and the Whole Earth Catalog, which I grew up poring through, as a key inspiration. The story of Apple’s products is a story of getting closer and closer to that vision. The infamous 1984 Superbowl ad set up Apple as the opposite of IBM’s (Microsoft’s) corporate mindset. The only thing that’s changed is that Jobs’ vision has won. The day after Steve Jobs passed away in October, besides my column on him, Busted Halo bloggers Tom, Annie and Vanessa — a seminarian, a music journalist and a young mother — all posted about the influence he’d had on them. This is one of many testaments to the far-reaching influence Jobs’ empowering technologies have had. As I said then, I crossed paths with Steve Jobs’ companies and creations many times. The first personal computer I ever bought was a hard drive-less Mac 512. A few years later, I wrote a landmark PC Magazine cover article about the Mac’s operating system, and had a column about the Mac for several years after that. In the early 2000s, my burgeoning videography career was made possible largely by Final Cut, Apple’s groundbreakingly easy to use video editing software. My benchmark of business success has always been Steve Jobs — as anti-corporate bad boy, as gadget guru, and especially as visionary of empowering technology. In his death, and reminded of his Stanford address, I am challenged by his example again. Are there things I want to be doing, ways I want to be living my life, that I’m not taking actions every day to make real? Well, yes. How about you? I still find it hard to believe Jobs won. In the early 90s, when I was pursuing a semi-back-to-the-land lifestyle myself in rural Maine, raising sheep (and writing about technology), it looked like Jobs and Apple both had had their day. Apple had fired its founder and turned its attention towards the business market, but failed to make any headway. People, including Jobs, were saying, simply, “Microsoft won.” But when Apple hired Jobs back in the mid-90s, two things happened. 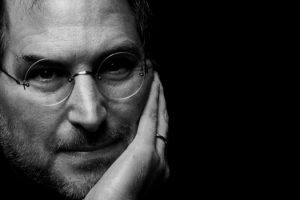 First of all, he restored Apple’s foundational principles and empowering mindset, which along with his brilliant visionary mind gave us in quick succession, the iMac, iTunes, iPod, iPhone and iPad. (There’s more about Apple’s technology in my earlier article.) Secondly, the internet changed the whole game. The internet is all about openness and interconnectedness, matching Apple’s strengths and undermining Microsoft’s weaknesses. Apple was briefly the largest company in the world just before Jobs died. Some pooh-pooh Steve Jobs’ role because many of his ideas are borrowed. He didn’t invent the idea of the graphical user interface, where electronically stored data is turned into a visual desktop with file folders and windows, but when he saw it in Xerox’s labs, he knew how important it was. Same with the mouse; same with desktop publishing; same with simple cabling and networks and wifi; same with music players and smartphones; same with tablets. And same with what a little company called Pixar was doing with animation. As Nino Amarena is quoted saying in Hedy’s Folly, the delightful new book about actress and inventor Hedy Lamarr, “the inventive process follows a cascade of ideas and thoughts interconnected from previous concepts that for the most part lie separate, unconnected and unrelated… to suddenly or serendipitously see the connection between the unrelated concepts and put it all together to create something new.” Jobs did not “invent” the mouse or the graphical interface or the folder and file metaphor, but he saw how they could all fit together into a broader goal. For Jobs, technology wasn’t the end; it was just a means. Jobs’ inventions aren’t lowest-common-denominator compromises designed by committee and driven by marketing research. Rather they are powerfully simple, fun designs, exciting because they are empowering — connecting people with their own dormant creativity, with other people, with music, images and video, in new and intimate ways. While many people have looked to Bill Gates for his business brilliance, or Warren Buffet for his investing shrewdness, my benchmark of business success has always been Steve Jobs — as anti-corporate bad boy, as gadget guru, and especially as visionary of empowering technology. In his death, and reminded of his Stanford address, I am challenged by his example again. Are there things I want to be doing, ways I want to be living my life, that I’m not taking actions every day to make real? Well, yes. How about you? Steve Jobs said, essentially, that he tried to live every day as if it might be his last. Hate and fear and sloth have no place in that context. This is also the Christian message. It is impossible to live out perfectly, but it is worth trying.